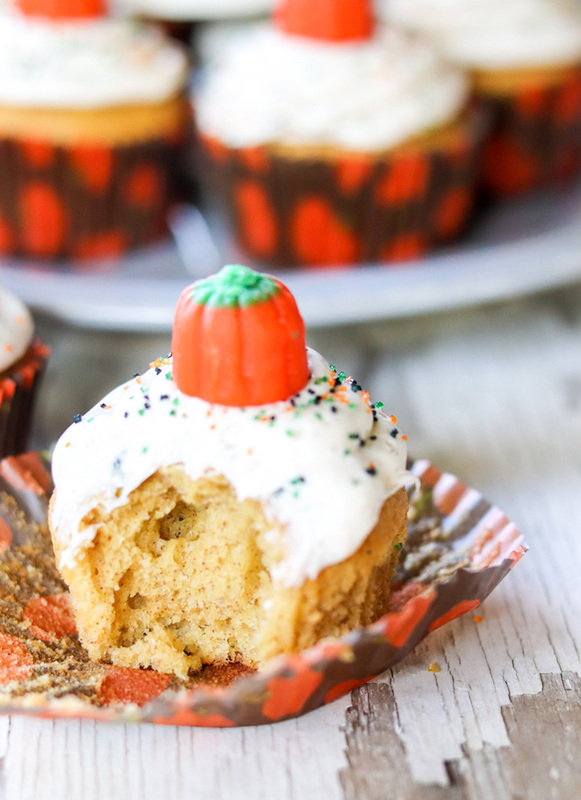 Moist delicious pumpkin spice cupcakes topped with a creamy Cinnamon Cream Cheese Frosting. 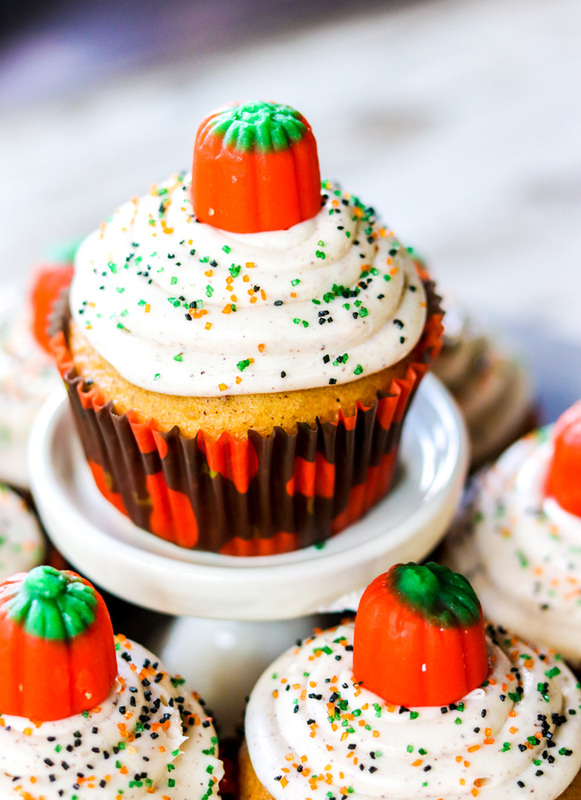 Cupcakes that simply scream Fall. 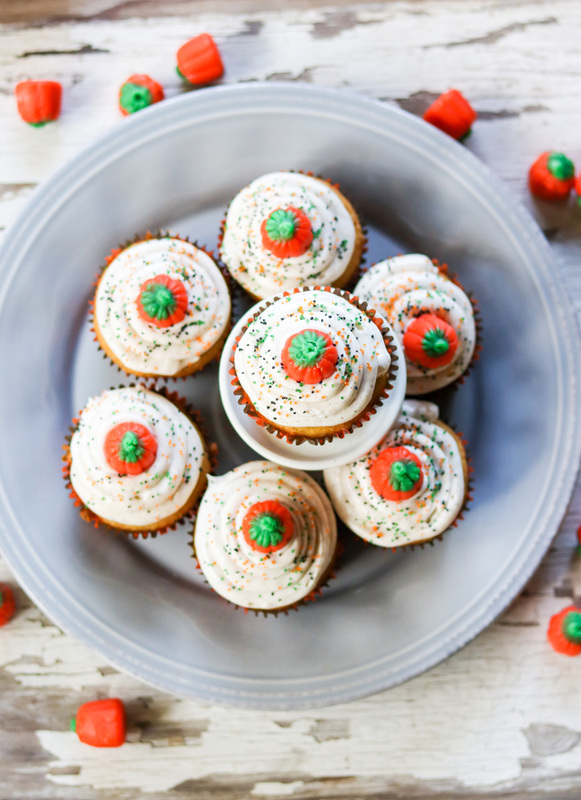 You will be so glad you tried these Pumpkin Spice Cupcakes with Cinnamon Cream Cheese Frosting! Wait what? This is the last day of #PumpkinWeek 2018 and I’m suddenly kind of sad. A week’s worth of hundreds of pumpkin recipes is always a favorite for me. Have you seen the pumpkin recipes shared all week? It’s going to take months just to try all the recipes I have saved. So much pumpkin goodness, both savory and sweet. 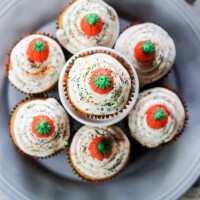 We made these fun Pumpkin Spice Cupcakes with Cinnamon Cream Cheese Frosting to end our pumpkin week recipes with a full on pumpkin theme. 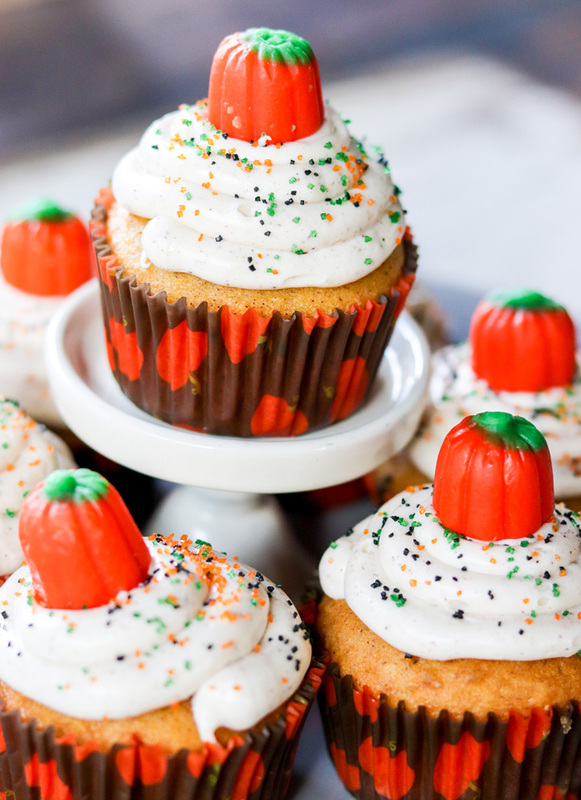 Even topped with those cute little pumpkin candies. 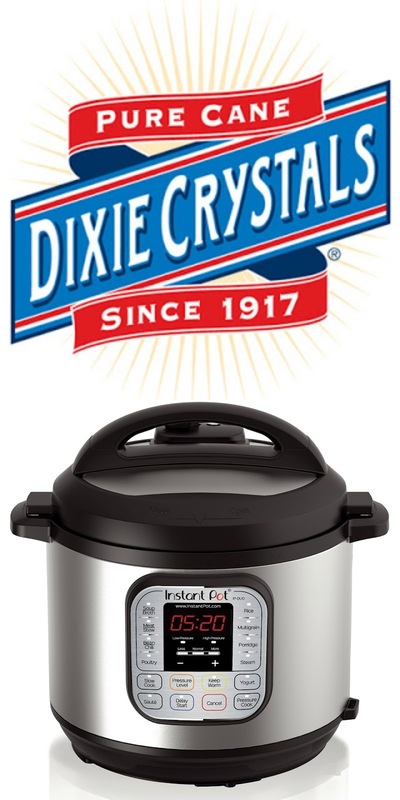 And we made sure that all of our sponsors got a place in the recipe, because that’s important too. Without them, these recipes would NOT have been the same. Honestly, I wish I could give them one of these Pumpkin Spice Cupcakes with Cinnamon Cream Cheese Frosting so I could thank them and they can see what deliciousness their products create. I don’t know if you’ve been paying attention this whole week, but if you can drag your eyes away from these super yummy Pumpkin Spice Cupcakes with Cinnamon Cream Cheese Frosting, I’d really like to take a final moment to say thank you to our absolutely amazing sponsors. 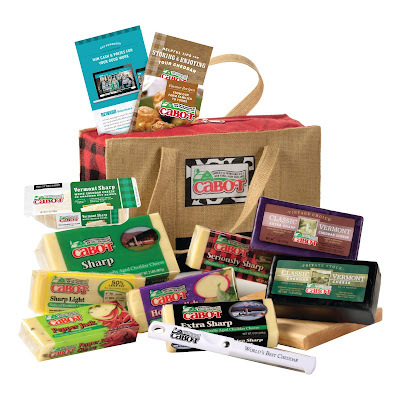 You guys are the most supportive brands, with some of the best products out there. Thank you so much for all you do to make pumpkin week extra special. #PumpkinWeek 2018 is (was?) hosted by Love and Confections and A Kitchen Hoor’s Adventures! A great big shout out, vitual hug and I guess a big dropping of virtual confetti to these two lovely ladies, for all of the hard work they did this week and prior. Their jobs aren’t over either, even with this last day. An event this big requires a lot of planning and follow-up. Thank you Terri and Christie, for all you guys put up with and do. We adore you. This year is even bigger and better than ever with a giveaway with some incredibly awesome prizes! Thirty nine bloggers from around the country are showcasing their best pumpkin dishes. Get ready for Fall with over 130 pumpkin recipes throughout the week including cocktails, main courses, pizzas, pastas, pastries, breads, muffins, and plenty of desserts! 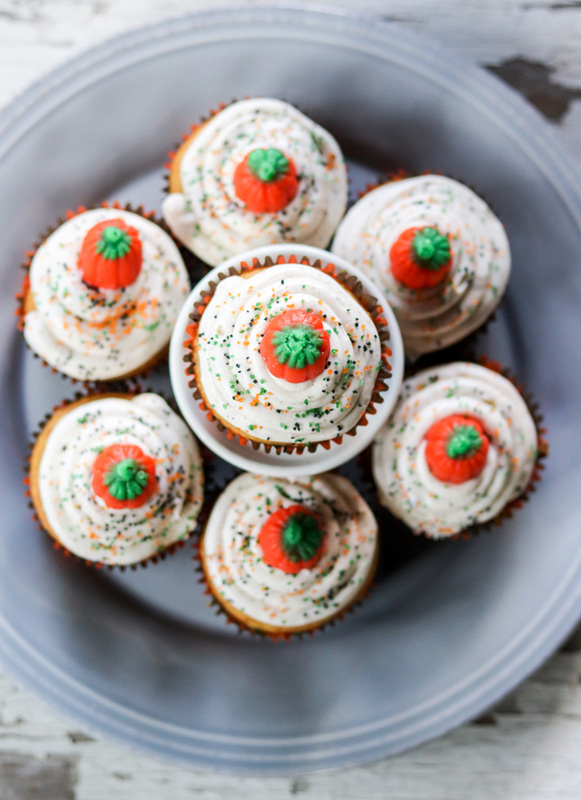 (most of mine were pumpkin desserts or breakfast, like these Pumpkin Spice Cupcakes with Cinnamon Cream Cheese Frosting) – just search pumpkin on my blog and you’ll find plenty! Are you ready to make Pumpkin Spice Cupcakes with Cinnamon Cream Cheese Frosting? 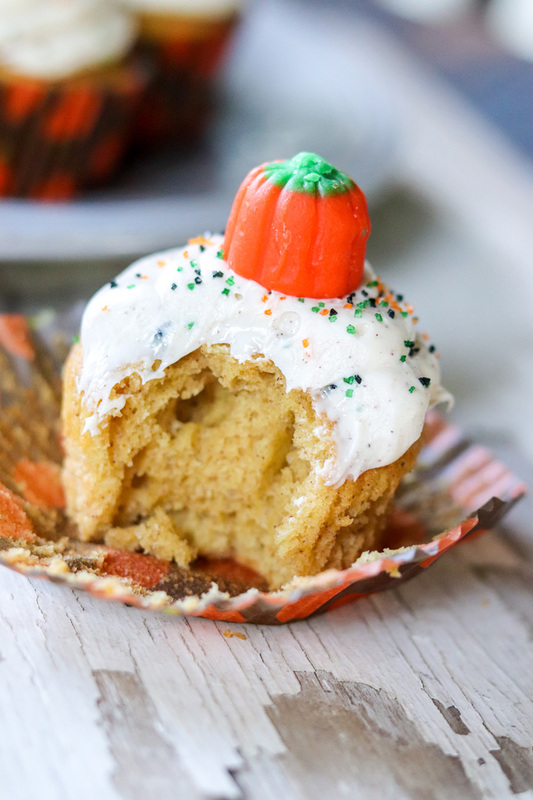 Moist delicious pumpkin spice cupcakes topped with a creamy Cinnamon Cream Cheese Frosting. Cupcakes that simply scream Fall. Preheat oven to 350°F. Line a 12 count muffin pan with cupcake liners and set aside. Whisk together the flour, baking powder, baking soda, pumpkin pie spice and salt. In another bowl, mix the pumpkin puree, vegetable oil, brown sugar, granulated sugar, eggs and vanilla extract until combined. Add the wet bowl of ingredients to the dry bowl of ingredients and mix just until everything is completely combined. Using a large spoon or an ice cream scoop, fill the cupcake liners about 2/3 full of batter. Bake in a 350°F oven for 20-22 minutes or until a toothpick inserted into the center of each cupcake comes out clean. Remove the cupcakes from the oven and allow to cool for 5 minutes before removing them to a wire rack to finish cooling. Cool completely before frosting. In a large bowl, beat the cream cheese, butter and vanilla extract until well blended. Beat the sugar in, a little at a time, blending well between additions. Add cinnamon and blend again. Once cupcakes are cooled completely, frost cupcakes as desired. Top with candies, sugars or anything else your heart desires.